From intimate galley kitchens to large gourmet workstations, the Align series of faucets from MOEN brings a refreshed, modern look to your home. Simple lines on the Align Pull-Down Sprayer Kitchen Faucet create its contemporary style, while a pull-down wand delivers in-demand functionality. The Align spring faucet is also designed with Power Clean technology that delivers 50% more spray power than faucets without Power Clean for efficient washing with less effort. In addition, this model features MOEN's exclusive Spot Resist finish that resists fingerprints and water spots to maintain its original brilliance and easily wipes clean, ensuring the beautiful stainless appearance will continue to shine over time. Dramatic design with modern features, the MOEN Align Spring Pulldown Kitchen Faucet delivers quality performance. This kitchen faucet offers plenty of clearance for taller pots and pans, extends your reach in and around the sink, and provides 2 spray options to make everyday cleaning jobs easier. Featuring single-sensor touchless activation, MotionSense Wave allows you to easily turn water on and off with the wave of a hand no need to touch the faucet with dirty or wet hands. Installation is quick and easy with the Duralock Quick Connect system, and the faucet can be mounted on either a sink or countertop. Inspired by soft curves and crisp edges found in nature to give it a transitional style that accents a wide variety of today's decors. The Reflex system was developed in a kitchen just like yours. By observing peoples' routines, MOEN created pull-down faucets to deliver an effortless faucet experience that makes your day-to-day tasks simpler. Inspired by nature, Kiran is organic in shape with subtle crisp edges tapering upward to provide a touch of modernity.Gracious and uncomplicated style features give the Kiran collection an ageless yet fashion-forward presence. Tailored yet relaxed, the Kiran collection is an exercise in design balance. This lustrous collection works seamlessly with today's lifestyles. 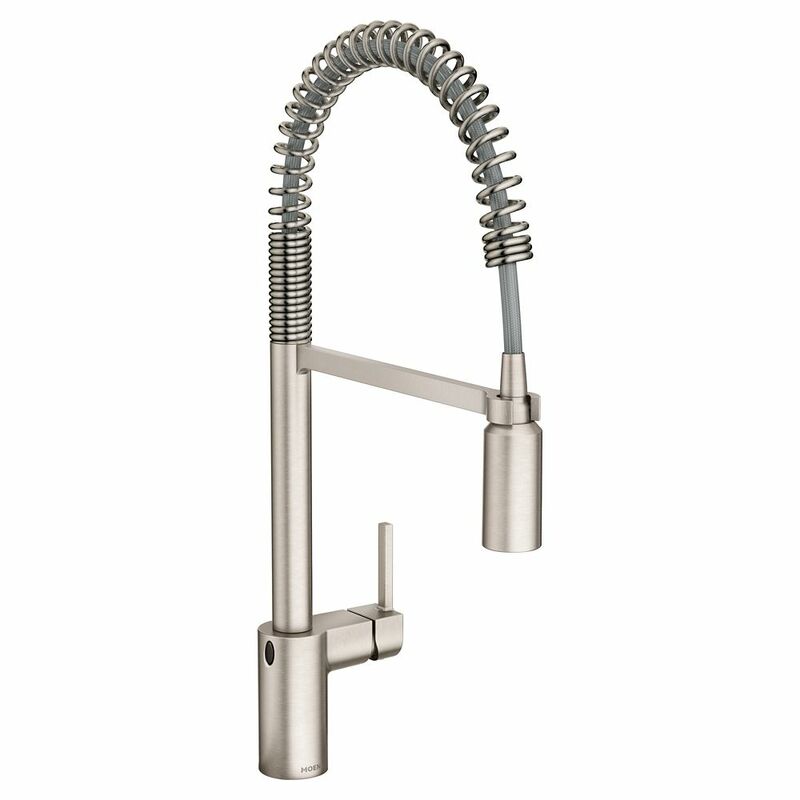 Align Motionsense Wave Pulldown Kitchen Faucet In Spot Resist Stainless From intimate galley kitchens to large gourmet workstations, the Align series of faucets from MOEN brings a refreshed, modern look to your home. Simple lines on the Align Pull-Down Sprayer Kitchen Faucet create its contemporary style, while a pull-down wand delivers in-demand functionality. The Align spring faucet is also designed with Power Clean technology that delivers 50% more spray power than faucets without Power Clean for efficient washing with less effort. In addition, this model features MOEN's exclusive Spot Resist finish that resists fingerprints and water spots to maintain its original brilliance and easily wipes clean, ensuring the beautiful stainless appearance will continue to shine over time. Align Motionsense Wave Pulldown Kitchen Faucet In Spot Resist Stainless is rated 4.4 out of 5 by 9. Rated 5 out of 5 by Jennifer from After 4 faucets in 4 months, we finally found the... After 4 faucets in 4 months, we finally found the one we are keeping! Rated 5 out of 5 by sjhart29 from Purchased this faucet for my son for Christmas. It works great and he loves it! Purchased this faucet for my son for Christmas. It works great and he loves it! Rated 5 out of 5 by kmb from This faucet has strong spray action. I like the motion sensor but don't use it much. This faucet has strong spray action. I like the motion sensor but don't use it much. Rated 5 out of 5 by Michael from High quality great faucet that has a spot free finish... High quality great faucet that has a spot free finish that works amazing, highly recommend this product.